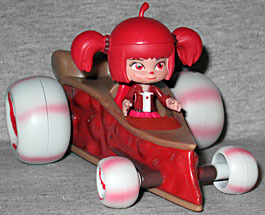 One look at her racing car and it's obvious that Jubileena is as sweet as a cherry pie. Her cheerful smile and her enthusiasm are really contagious. Despite being one of the best racers of Sugar Rush, she doesn’t always aim for the finish line. Winning is nice, but in the end, the only thing that really matters is love! 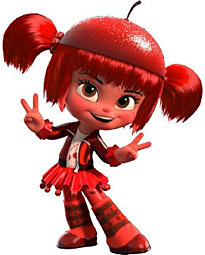 You know, that biography makes Jubileena sound pretty nice, but it doesn't stop her from being a total hag toward Vanellope at the first opportunity. 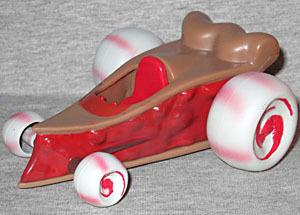 This racer has a very clear theme: cherries. Her hat is a cherry, she's named after a cherry (which was itself named after a Chinaman), and her clothes are all cherry red. You can't see them on this tiny toy, but there's a cherry on her shirt, and more of them on her socks. This is not a character who has a mixed message. Even her kart gets in on the act. Dubbed the Cherriot (get it? ), it's clearly just a slice of cherry pie with scoops of ice cream for wheels. What kind of ice cream? Well, since there are red stripes through it, we're going to go out on a limb and say it's cherry. Not since Crumbelina DiCaramello have we seen a kart that is so obviously just a piece of confectionery scaled up to giant sizes. The toy is not as detailed as the CGI renders in the film, obviously. That one had flaky crust, realistically pitted tires, and dozens of cherries jammed into the pie filling that's visible on the sides of the kart. 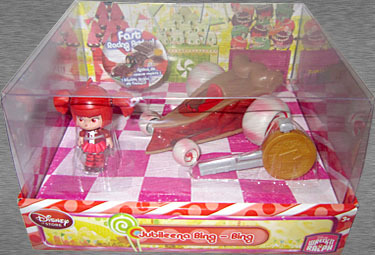 The toy is just smoother in general: the broad shapes are the same, but the fine detail is missing. The wheels are the same on both sides of the car, which mean that the swirls on the righthand side turn the wrong way (unless she's driving backwards). The racer sets are sold in nice boxes that display the toys well. The entire top is clear, allowing full views of the car and the figure (as well as the golden coin key). The bottom of the display is pink and white checkerboard, showing the start/finish line, while the back shows some of the grandstands - Jubileena's own chocolate kisses, the gumdrops that are marks for Minty Zaki, and the gumballs that are on Team Snowanna Rainbeau. This is a really lovely display, perfect for MOC collectors. As mentioned previously, some of the Sugar Rush racers had palette swaps to create new characters. The dark blue Jubileena is not, as you might expect, called "Blubileena" - rather, she's Citrusella Flugpucker. That sounds dirty somehow. Her car gets similarly hue-shifted to be a blueberry pie, so buy a second of this set and make your own! This entry was posted in blog exclusive review, Disney and tagged Wreck-It Ralph. Bookmark the permalink. Dude, "chinaman" is not the preferred nomenclature. Asian-American, please. Yeah, it really would have tied the review together.